Olympic gold medalist Mikaela Shiffrin flies through the World Cup Course during practice last week on the difficult Strawpile course. World slalom and GS races will be held at 10 a.m. and 1 p.m. on Aspen Mtn. on Saturday and Sunday. It’s been two years since the Audi FIS Ski World Cup last visited Aspen, and American Mikaela Shiffrin surprised with a pair of top 10 finishes in both slalom and giant slalom on the difficult Strawpile course. Shiffrin surprised again by winning the opening giant slalom race of this season in Soelden, Austria, (she tied with Anna Fenninger), as the Sochi Olympic slalom gold medalist has been traditionally stronger in that discipline. Coming into this weekend’s Nature Valley Aspen 2014 Winternational as the overall World Cup leader after two races, Shiffrin now finds herself the favorite in a field deep with past Aspen winners. Tina Maze’s record-setting 2012-13 season, when she earned 24 podiums and more than 2,000 points, included a November victory in Aspen. Since 2007, Austria’s Kathrin Zettel has won both slalom and GS here. Tessa Worley of France had Aspen victories in 2008 and 2010 — both were in giant slalom. No stranger to the podium herself, Viktoria Rebensburg of Germany has finished first, second and third at Winternational. Visibly absent will be Lindsey Vonn, who struggled with illness here two years ago and finished 21st. Coming back from injury, Vonn will skip Aspen in favor of making her North American debut next week in Lake Louise, Canada. So hopes remain high that Shiffrin, who is very much at home on Aspen Mountain, will take her workman-like approach to ski racing and show the small U.S. Team represented how to get the job done. This is Shaw’s first Winternational in his new role as head of the U.S. Ski Team, taking over from Aspen native Bill Marolt, who retired in 2014 after 18 years at the helm. Shaw competed here in the 1980s and also claims a local stake because of the summers he spent working on the Strang Ranch. Patrick Riml, alpine director for the U.S. team, said a return to this challenging course that’s steeped in history is good for the sport. 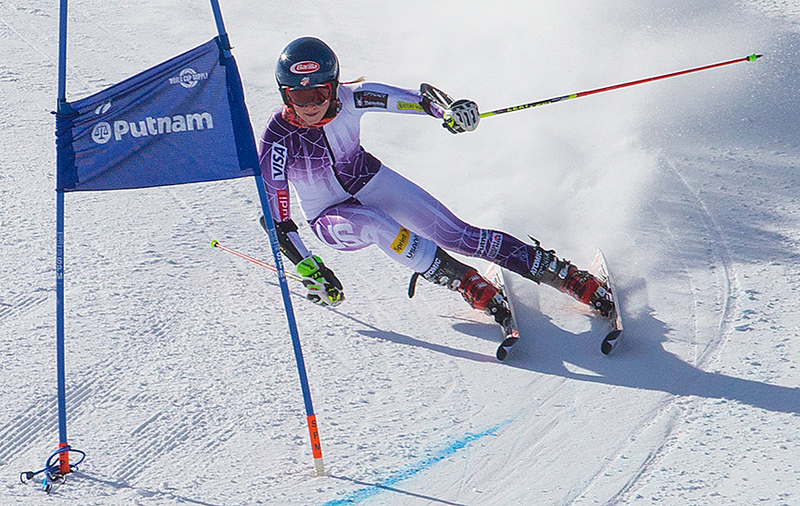 The first run of Saturday’s giant slalom and Sunday’s slalom are scheduled to begin at 10 a.m. The World Cup tour skipped Aspen last November in order to give Vail/Beaver Creek an additional test run for the 2015 FIS Alpine World Ski Championships, which are Feb. 2-15. John “Johno” McBride, alpine head coach for Aspen Valley Ski and Snowboard Club, watched Shiffrin train this week next to his FIS athletes. Winning on this Aspen Mountain course has demanded a solid, risk-taking approach throughout the years by everyone from Franz Klammer, Bill Johnson, Marc Girardelli and Ingemar Stenmark. “It doesn’t matter if it’s men or women,” the competition level is always high on a hill that commands respect from the FIS, Riml said. In 2017, both the men and women will return to Aspen for the World Cup Finals, a prestigious event open only to that season’s best finishers. For this weekend’s giant slalom race, the course drops 1,112 feet and is almost 4,000 feet long. A start elevation higher than 9,000 feet above sea level adds an extra challenge. “It’s not just the U.S. team but the whole world. Everyone’s looking forward to being in Aspen,” Riml said. That includes the lean but mighty U.S contingent that will be represented in the home opener. American Julia Mancuso is always a contender, as she showed with her 17th place finish in the Soelden season opener. Mancuso was third here in 2011. Minnesotan Paula Moltzan had two top 10 results at the Junior World Championships and is someone with a bright future, Riml said. The field of Americans this weekend also may include Megan McJames, Hailey Duke and Resi Steigler. One of McBride’s favorites this year hails from Steamboat Springs. Back from a knee injury that curtailed last season’s upward trajectory, talented skier Tina Weirather of Liechtenstein also seems poised for improved results this season, McBride added. Editor’s note: Madeleine Osberger is covering the ski industry and Snowmass Village for Aspen Journalism in collaboration with the Aspen Daily News, which published this story on Friday, Nov. 28, 2014.